In the fiscal year ending in April of 2010, the company reported sales of approximately $11.203 billion dollars and had 48,000 employees. The company has long been the world's largest pork packer. More recently it has become the world's largest hog producer. The combination of farming and meat packing is unique and has radically altered the pork business. In recent years the company has also acquired beef operations. It is the fifth largest beef packer and a leading producer of deli meat and processed foods. Since 1981 when it was a regional pork producer, it has made over 20 acquisitions and expanded operations and exports abroad. The company's growth has been largely unimpeded by anti-trust actions. A 2003 acquisition of the bankrupt Farmland Foods elevated Smithfield from 20% to 27% of the market; without a murmur of protest from the U.S. Department of Agriculture (USDA). The Environmental Protection Agency (EPA) campaign against massive water pollution from its North Carolina and Virginia factory farms was soft pedaled; in spite of hog waste run-offs that turned rivers into toxic dumps. The company also struck down state laws prohibiting meat packers from owning the animals they slaughter. In 2004, the National Labor Relations Board found that Smithfield had used intimidation to derail a 1997 union election at the Tar Heel plant through threats, spying and firings. A federal appeals court upheld a 2006 decision which concluded that the company had engaged in "intense and widespread coercion” and ordered the reinstatement of four fired workers. One of the fired workers had been beaten by the plant's police on the day of the election. The union failed to organize that year. After the incident, the North Carolina Council of Churches sent a letter to Ms. Dean describing conditions at the plant. The letter included a report based on data from the Occupational Safety and Health Administration (OSHA). According to the data, worker injuries were up 200 percent since 2003. The company claimed its injury rate was no different from the industry average. The union vowed to continue demonstrating at Ms. Dean's book tours, on a larger scale. “The line is so fast that there is no time to sharpen the knife. The knife gets dull, and you have to cut harder." "One female employee told me that was her stress relief for the week. That's the type of person doing those jobs. ... The treatment of the baby pigs shook me the most." "We believe that these acts of abuse constitute a violation of state animal cruelty laws. Employees were gouging out the eyes of pigs and violently dragging animals by an ear or a snout or a leg. A supervisor admitted on camera to viciously attacking pigs with metal rods." "Non-conformances to the company's animal welfare policy were found. Appropriate actions have been taken, including termination of those who violated the policy." "(The abuse) happened every day. You can't even capture the full horror of what goes on there." "Working with our customers, who have made their views known on the issue of gestation stalls, we are pleased to be taking this precedent-setting step." When Smithfield executives announced plans in 2007 to phase them out, they refused to admit they were inhumane. Rather, they attributed their decision to consumer preference. 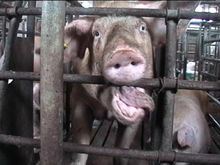 A sow living in a typical industrial facility will spend the majority of her life confined to these metal and concrete stalls. She will have barely enough room to lie down and not enough room to turn around in. 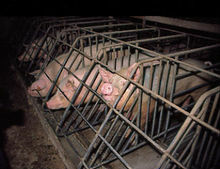 Several states legally banned gestation crates and the European Union (EU) has required farmers to phase out all gestation crates by 2013. "If this is the best that Smithfield can do, it is evident that there are terrible problems in the nation's pig industry. It is indefensible for Smithfield to allow its sows to linger in crates barely larger than their bodies for months on end. ...Now that Smithfield just posted its highest ever quarterly profit, it's a good time to make a public pledge to honor its previous commitment. The company can no longer claim that economic circumstances don't allow for facility improvements. Other large pork producers, such as Maxwell Foods, are already gestation crate-free, while Cargill is 50 percent gestation crate-free." "We provide regular training to our employees on our animal welfare policies and procedures, and we have zero tolerance for any behavior that does not conform to our established animal well-being procedures." See also animals raised & hunted for food on pigs. Smithfield churns out a sea of waste that has destroyed rivers, killed millions of fish and generated one of the largest fines in the history of the EPA. The company slaughters approximately 27 million hogs per year, each hog with a slaugter weight 50% heavier than a person. The logistical challenge of processing that many pigs per year is roughly to butchering and boxing the entire human populations of New York, Los Angeles, Chicago, Houston, Philadelphia, Phoenix, San Antonio, San Diego, Dallas, San Jose, Detroit, Indianapolis, Jacksonville, San Francisco, Columbus, Austin, Memphis, Baltimore, Fort Worth, Charlotte, El Paso, Milwaukee, Seattle, Boston, Denver, Louisville, Washington, D.C., Nashville, Las Vegas, Portland, Oklahoma City and Tucson. In 1995, when the company was attempting to persuade the State of Virginia to reduce a large fine for the company's pollution, CEO Joseph Luter contributed $100,000 to governor George Allen's political action committee. "We're sort of back where we started from. The cost is just too high. The average hog farmer couldn't afford it." He added that a moratorium currently blocking expansion of pig farming in the state was a "good idea." In 2002, Smithfield Foods made the Sierra Club's "Ten Least Wanted" list. Just weeks after the second-largest beef recall in history, the Sierra Club released a report on hundreds of criminal and civil violations of America's largest corporate factory farms. The Rap sheet documented convictions for animal cruelty, bribery, records destruction, fraud, worker endangerment and pollution. For centuries, from the Hapsburg Empire through Communist dictatorship, peasant farmers in Romania eked a living from hogs, driving horses along ancient pocked roads and whispering ritual prayers on butchering day. Old customs and jobs are dying and the air itself is changing, transformed by Smithfield Foods. Almost unnoticed by the rest of the Continent, the agribusiness giant has aggressively moved into Eastern Europe, assembling networks of farms, breeding pigs and slaughtering pigs on the fast track. "It smells so bad, we can't sleep at night." See also video (right). According to the Smithfield's annual report for 2006, the company plans to nearly double its sow herd in Poland, from 61,000 to 120,000 head. If accomplished, it will produce about 2 million hogs in the country. "Acquisition of stock in a firm that is also being considered as a takeover target or merger partner is not 'solely for the purpose of investment' under the HSR Act and is not exempt from the filing requirements. Ensuring strict compliance with the Act is crucial for effective antitrust enforcement. The Department will continue to closely monitor antitrust compliance in agriculture sectors." Smithfield is a member of the American Meat Institute & the National Pork Producers Council (NPPC). Joseph W. Luter III (71) - Chairman & Consultant - 69K with 19.02M in exercised options. C. Larry Pope (55) - CEO & Director - 2.6M with 373K in exercised options. This page was last edited on 26 June 2017, at 14:44.